If you’re in the market for a church template that offers something fresh and bold, why not try this latest in our Evangel series of themes? 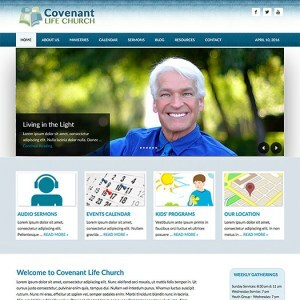 This WordPress church theme, built to run seamlessly on the WordPress Genesis framework, offers custom, textured backgrounds and bold color contrasts to create a captivating visual experience for the end user. And being that this is a fully responsive layout, it’ll display well regardless of where and how a church member or visitor is accessing your website. And of course, as with each of our new super-powered WP themes, this Evangel-3 theme offers a robust, user-friendly back-end content management system interface. That means that you, or whoever is in charge of managing your site, will be able to make updates, changes, and additions with ease. Better still, this church theme purchase comes complete with the full live demo install file, which means you’ll be up and running with just a few short clicks. All images and pages and styles you see on our live demo will immediately be available to you after the install. And from there you’ll be able to quickly, and if we do say for ourselves, pretty effortlessly customize your site as you see fit.